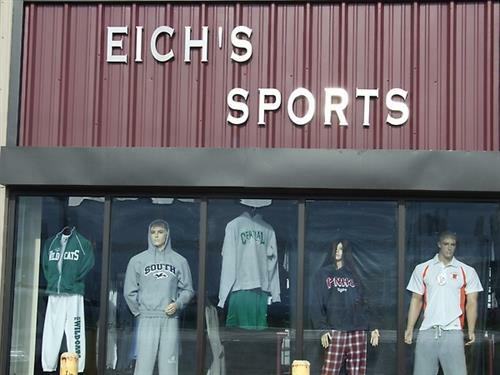 Eich's Sports, founded in 1988, is a Local Sporting Goods store with locations in 3 towns. Plainfield, Coal City, and Lemont are owned by the Eich's. Chuck, Betty, Brian, and Tracy are proud to provide the local communities with a place they can go get local spiritwear to help show the pride of their town! All 3 locations are stocked with the best sporting goods to help you out as well. Eich's specializes in Screen Printing and Embroidery and is able to do an efficient turn-around because all work is done on-site! The Plainfield location also is the home of the In-door Sports Complex which has 3 indoor Batting Cages, a Full-sized gym which is home of the Eich's Volleyball Club, a Team Training area for Volleyball, Baseball, Softball, and much more!